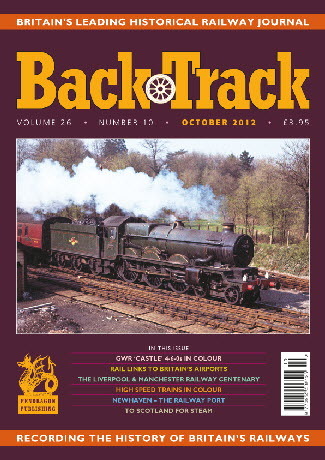 BackTrack October 2012 journal from Pendragon Publishing. Here come the High Speed Trains - four pages of colour by Rodney Lissenden of this BR success story, showing a range of liveries carried. Track Record: A Financial History of British Railways 1948-1954 - Part Three - Capital Improvements - John W. E. Helm concludes this important survey. The White Ghost - Alistair F. Nisbet shows how BR tried to breathe new life into its ageing diesel multiple unit fleet in the 1970s. Camden Bank and Shed - four pages of archive photos of the climb out of Euston in steam days. The Liverpool & Manchester Railway Centenary Celebrations of 1930 - Jeffrey Wells describes the important exhibition staged by the LMSR in Liverpool. Pitsford and Lamport Ironstone - two colour shots by Roy Hobbs of a Northamptonshire industrial railway. 'Castle' Country' - four pages of Michael Mensing's colour shots of GWR 'Castle' 4-6-0s on the Birmingham main line. Newhaven - The Railway Port - Michael B. Binks describes its origins and fluctuating fortunes. The View from the Tower - two colour photos by John Spencer Gilks from the top of Blackpool Tower of North and Central stations in 1967. Where Trains meet Planes - Geoffrey Skelsey presents an outline of rail links to Britain's airports. To Scotland for Steam: August 1962 - Ken Livermore tells how two 15-year-old boys set out on an 800-mile Scottish 'shed bash'.